I realize that I am milking my vacation dry with post after post, but I really had such a great time and wanted to document and share all of my finds. Today I wanted to share my love of an artist I discovered last year on my trip to Wellfleet, Carol Aust. I posted about Ms. Aust last year and then fell in love with her all over again on the recent trip when I saw some of her latest works on display at the Left Bank Gallery in Wellfleet. In particular, I fell head over heels for her piece, Going Deeper, which is so simple yet evokes all sorts of things. 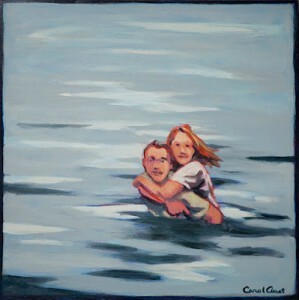 The acrylic on wood painting features a young couple in the ocean looking out at the viewer. I can’t explain it, but I love it. My friend Lynda also loves the work and is spot on when she said it would make a great wedding gift for the right couple. I think it would make a nice gift for me, but so far no one is biting on that one… marriage or otherwise. “Going Deeper” by Carol Aust (original now on display for sale at the Left Bank Gallery in Wellfleet, MA. See more about artist Carol Aust here. Visit the Left Bank Gallery here. I have made no secret of my love of a good spring water – still and sparkling. In fact I have been on a big kick since purchasing my Soda Stream home soda maker a couple of weeks back – drinking a ton of my own home made sparkling water out of the purest spring water I can find. Meanwhile, I am always on the lookout for a good pre-bottled spring water and I have found a good one from Arkansas, Mountain Valley Spring Water. 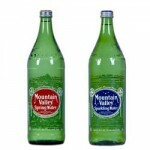 I love the look and the old style glass bottles of Mountain Valley Spring Water. The only problem for me is that they do not distribute their products to the Northeast (where I live in the glorious state of New Hampshire), but thankfully, Mountain Valley Spring Water sells on line and delivers everywhere. 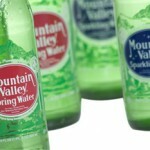 Visit the online store of Mountain Valley Spring Water here. Lost Cowboy is powered by	WordPress 5.0.4 and delivered to you in 0.849 seconds using 42 queries.